His name is connected with football royalty and he’s charting his own path toward that destiny. Ronaldo Morrison has headed off to Johnson & Wales University in North Miami, where he’ll play for the Wildcats during the upcoming NCAA season. Morrison, 17, left Monday, 29 August, after playing against his new school in the Brac Cup International 2016 with his local side, Cayman Brac FC. “I knew I had to show something to try to impress them and at the same time I was saying what if I don’t have a good match and they say they don’t want me but I still gave my all,” Morrison told CaymanSportsBuzz.com after the match against his new college side the evening before his departure. Morrison celebrates his goal amid a downpour. 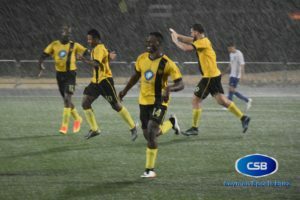 The talented forward scored Cayman Brac FC’s only goal against Johnson & Wales, when he collected the ball in the box and drilled it past the keeper but it was not enough as the American college team won 2-1. “I scored that one goal and I’m really proud of that. I gave a good showing,” he said, summing up his performance. Phil Zayas, the Wildcats head coach, was impressed with what he saw from Morrison during the Brac Cup. “He was very good in the tournament and we’re looking forward to him [playing] with us. He demonstrated some good technical ability, a lot of speed and I think he will be a great addition to our squad,” Zayas said to CaymanSportsBuzz.com. The teenager said he is looking forward to suiting up for the Wildcats and hopes it is just another step on his way to greatness. “Ronaldo is a real talent and he’s going to be missed by me as a coach, a mentor, a friend. He is going to be missed by all the players on the team,” said coach Mitchum Sanford. The team from the Sister Island will also be without another of its best players. Brian Martin has returned to Warner University in Florida as he continues his NCAA career as a senior for the Royals. Keep up to date with all the latest sporting news from Cayman. © Tower. All rights reserved.